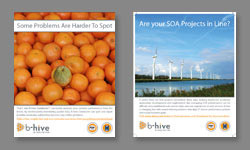 Compelling brochures make a big difference in your clients' perception of your business. The good news is that they needn't be expensive. 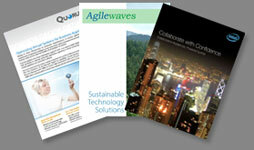 I've created dozens of brochures, datasheets, case studies, and the like. A design, once finalized, can be reused and built upon over time, creating a uniform corporate style and cutting design costs. A striking image and a powerful message in a few words. Readers decide whether an ad is interesting to them in less than half a second. I've created print ads for several trade publications and can contribute to your messaging and imagery to create an eye catching ad. A corporate logo defines you more than anything else. Color and form are paramount. A font can imply dynamism or trustworthiness. Colors can be associated with youth and trendiness or solidity and reliability, and a small flourish can go a long way. A good logo is easily identified and easily remembered.